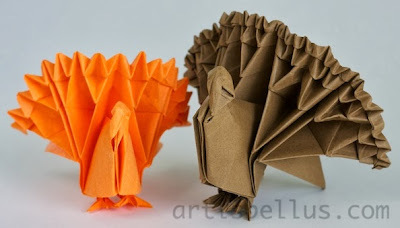 These turkeys will be a nice complement to your Thanksgiving table decorations. The turkey was designed by Jun Maekawa. It's a very interesting origami model, although not for beginning folders. The instructions to fold it can be found in his book, Genuine Origami: 43 Mathematically-Based Models, From Simple to Complex . I used a 12" (300 mm) square of orange washi paper for the smaller one, and a 14" (350 mm) square of brown Tant paper for the bigger one.